The Bruja's adopted daughter lives on. Lady Mayhem, nightmare mirror of the Antecedency. 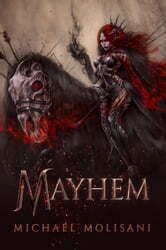 As Mayhem prepares to retire, she is pulled into a gossamer conspiracy of enigmatic gods and flawed mortals. The balance of power twists, shrouding enemies. Mayhem is forced to unravel treacheries and bargains. But first, the Antecedent battlewitch must come to terms with her own monsters. These fearsome creatures do not wear scales or growl in shadow, however. They are creations of the Collapse, trauma beyond imagination. In this highly anticipated sequel to 2018's breakout hit, "The Bruja," Michael Molisani returns you to the Collapse with a riveting tale of horror, intrigue, and lascivious brutality.